Get Involved: What you can do. Posted 8 June 2017 by clareh & filed under Destitution, Welcome. Stagecoach supports travel costs for refugees and asylum seekers in Exeter. Stagecoach South West has donated 100 travel vouchers providing much needed support to asylum seekers and refugees living in and around Exeter. “We hope this donation goes some way to help refugees access the help and support they need as they rebuild their lives in the South West” a Stagecoach South West spokesperson commented. This generous donation is warmly welcomed by Exeter City of Sanctuary, who worked with Stagecoach South West, alongside other organisations, to identify ways in which they might play a part in making Exeter a place of welcome and opportunity for asylum seekers and refugees. “The travel vouchers will be of great assistance to the people we work to support”, says Refugee Support Devon (RSD) Nelida Montes de Oca, Casework Coordinator, who will administer the vouchers. “Many of the people who will benefit are close to destitution. Others are simply trying to rebuild their lives in Devon, having fled atrocity and suffering. In these circumstances, every act of kindness makes a big difference”. According to the British Red Cross, the numbers of destitute asylum seekers and refugees in the UK reached almost 15,000 in 2016, representing a 10% increase from the previous year. The reasons for such destitution are varied; some may have had their asylum claims refused and are appealing the decision, others may be awaiting a decision on their right to remain in the UK. In both such cases, people are not allowed to work and may have no access to Government support, or limited support of £37 a week. This leaves many people homeless, facing serious health problems and extremely vulnerable. With a limited ‘Emergency Fund’ at its disposal, RSD can offer £10 per week per person to help in such cases. “This is to help cover people’s essential needs, but obviously it is not enough” explains Nelida at RSD. “Having this extra support from Stagecoach South West will make a big difference, allowing people to reach important legal or medical appointments, English classes, or simply meet up with support groups and friends”. Stagecoach South West’s generosity is a strong indication of the wider support for the plight of refugees and asylum seekers in and around Exeter. Exeter City of Sanctuary encourages all members of the community to create a culture of welcome and to pledge practical support for asylum seekers and refugees. © 2019 Exeter City of Sanctuary. 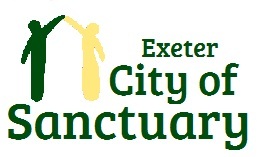 Exeter City of Sanctuary is part of the City of Sanctuary Network, a movement spread throughout the United Kingdom and Republic of Ireland, committed to building a culture of hospitality and welcome, especially for refugees seeking sanctuary from war and persecution.